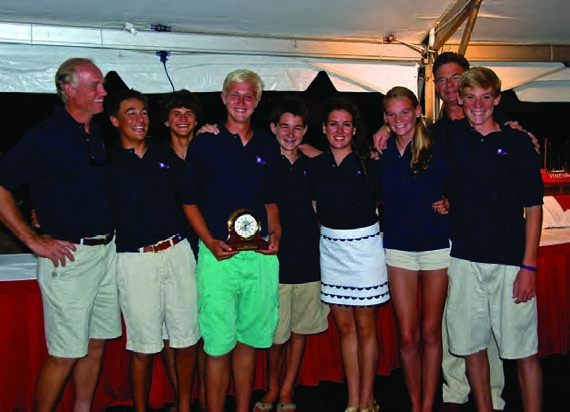 In perhaps the most stunning victory in the 79-year history of Stamford Yacht Club’s Vineyard Race, eight members of the American Yacht Club Junior Big Boat Team accomplished what many much more experienced sailors spend a lifetime trying to do. Furthermore, these young sailors (ages 12 to 17) won this Labor Day weekend classic in their very first attempt. Sailing Patriot, a J/122 loaned by co-owners Steve Furnary and Peter Duncan, the team of Collin Alexander, Carina Becker, Key Becker, Will McKeige, Sam Papert, Madelyn Ploch, Haley Rodriguez and Sean Walsh, topped a very competitive 90-boat fleet that included a large flock of Buzzards (sailors who have completed 10 or more Vineyard Races), correcting out 25 minutes ahead of the first boat to finish, George David’s Reichel/Pugh 90 Rambler. Also aboard Patriot were adult safety advisors Doug McKeige and Peter Becker, the Director of the AYC Junior Big Boat Team. Patriot captured the prestigious Vineyard Lighthouse Trophy as the boat with the best corrected IRC time, and the team became the first winners of the Corinthian Challenge Trophy, created to encourage young sailors to participate in the Vineyard Race. Here then is the story of this remarkable team, in their own words. After completing the Block Island Race earlier in the summer on Lir and experiencing 25-35 knot winds, I had some understanding of what distance racing is all about and I knew I wanted to do more. We were talking about the Vineyard Race months in advance, but nothing was really set in concrete. After having a boat generously donated, I knew it was really going to happen and was overjoyed. I was driving when we were approaching the Texas Tower – which had no lights on – when Peter Becker told me that the tower was only 300 feet off the bow and that I could scrape the rig…it was quite nerve-wracking. Just doing the Vineyard Race was a blast and a half, but returning to our mooring and hearing someone say that we were currently first in our division…“Wait, we are first overall!”…was a feeling that really brought all the hard work, practice and, most importantly, fun times, to a great conclusion. The Vineyard Race was an exciting end of the season. The distance, bad weather and big waves were not a problem for us. The main issue was finding a fast boat that could be easily crewed by juniors. Racing on a variety of boats like Swan 45s, Swan 42s, J/105s and J/122s, we didn’t have much practice distance racing with one certain boat. But that didn’t matter, because we were a bunch of kids sailing with our dads. We were the ultimate underdogs in this race, and we faced hard competition. Our race was won when our rock star navigator Peter told Sam to steer for the Gut. Going 12.5 knots through the Gut and cruising down to the rest of the fleet at 10 knots is where we flew. The best part of the race was when we sent Key, our crazy bowman, up the mast to attach new spin sheets while a 120-foot fishing vessel was getting tossed around like a rag doll in the ocean waves. There were times when things got hairy and both grownups were below. We would wipe out, recover and keep sailing, without Peter coming up to say, “Wiping out is slow!” We rounded the tower with everyone in good spirits. I was not off watch yet, and I was really tired. Just as I was about to lay down I heard, “Collin, get up! We’re doing a sail change.” How many sail changes did we have to do? Working the pit was hard in a long race, but Peter kept me going by teasing me all the time: “You going to cry, Collin?” We battled the waves with Will at the helm until 0600, when I woke up to hot chocolate and oatmeal. After thanking Peter, I realized this was somewhat of a trick. He guilted me into taking the helm for the next two hours…oatmeal can do that at that hour. We had a rough rounding of Block Island, with Peter, Doug and I working the boat. Everyone was puking; Sam and Haley had it the worst. Sam didn’t understand that you don’t puke on yourself, and Will had to carry him though tacks…a great way to come up from watch! We did about 100 more sail changes and finished, and then my dad texted me – from China – that we had won. It takes a lot of guts to bring a bunch of kids on a Vineyard Race, and I thank Peter for that. Doug was The Man – a perfect grownup to have on the boat with us, and I could not think of a better combo of adults. Will, Key, Sean, Sam, Haley, Carina, Maddy and I had a blast. My best memory from the race by far is going up the rig to switch out the spin sheets. We were sailing really deep with a fresh runner we had just put up. The tackline was out about four feet and the sheet was eased as far as it could go to ensure maximum speed, which made for an interesting trip up the mast. As I was hoisted, I tried not to look down and focus on getting the job done. Looking around after making the change, I saw dolphins swimming next to the bow. Then I insisted that they lower me so I could return to my comfy spot on the rail to get some rest. For three great summers, I have had the opportunity learn as much as I could about big boats as a member of American Yacht Club’s Junior Big Boat Team. I’ve raced on many different big boats, including J/105s, a J/122 and a Farr 400. On a weekly basis, our team races Young American, a J/105, in Thursday night Can One races and Friday night Sunset Series. Young American also competes often in Stratford Shoal races. The amount of sailing the team does is awesome. Most of the knowledge I’ve learned is about the front of the boat, as I am often bow. Our preparation for the Vineyard Race started well before August 30. We met on Tuesday to do boat work. We cleaned the boat, removed all unnecessary things, flaked all five headsails, and packed four kites. The following day, some of us went for provisions while the rest sorted out the boat. After meeting at the dock at 1000 Friday, we took a RIB out and left it on the mooring because we didn’t know if the launch would be operating when we returned. As we waited for our start, Key, Sean and I discussed which kite to set for the first leg. We ended up setting the reacher. Key and Sean set the kite flawlessly, and I trimmed as Sam steered us though the starting line. Block Island Sound was a new experience for me. I had never sailed in water that unprotected. While I was on watch, somewhere between 2200 and 0100, I was trimming main and I heard a loud splash from three feet behind me. It was a dolphin! At 0240, Key was sent up a halyard to attach the starboard spin sheet. We had done a kite peel to set this kite, so the sail went up with only one sheet. At 0300, Collin, Maddy and I were officially off watch, and I was exhausted. I was below for about five minutes when I was told we were going to do a sail change and I was needed. Collin was also called back to be pit through the sail change. Peter wanted me on bow with Key because there were large waves and the wind was strong. At 0320, Key and I executed a flawless kite peel. It’s amazing that the change occurred without a hitch because it was so late. Once the kite was up and the lines in the cockpit in order, Collin and I went off watch. I went below for about ten minutes, and that ended up being a mistake. On the Beach Point Overnight, I was able to stay below as navigator for majority of the race and I felt fine, but Block Island Sound has bigger waves and this time I wasn’t so lucky. Sitting on the rail as the sky became lighter, I did not feel well. I futilely tried to convince myself I felt fine, but this wasn’t a case of mind over matter. I consulted with Peter and Doug and moved to the stern. Downwind and safely out of the way, I had the misfortune of being seasick. A bottle of water, a Gatorade, a Cliff bar and a few hours later, I was good as new. Sam had similar bad luck, but after a good nap and some water he recovered, too. The rest of the race was less hectic, and we had a yummy lunch of PB&Js. Either Peter makes the best PB&J I’ve had ever had, or overnight races make everything taste better. During this part of the race, Sean, Key and I made numerous sail changes. I’ve never worked with such a great team on the bow. Approaching the finish, Peter checked the wind angle that we’d have when we rounded into the channel and we realized we might be able to carry a kite. We flew the kite for the last leg, crossed the line and everyone cheered. We couldn’t believe we’d finished. We de-rigged the boat as we motored home. We got to the mooring two hours later and Will kicked me awake. I checked my watch: 2330. A cheering crowd of our parents greeted us at the dock. It was an unbelievable feeling. The next morning we re-flaked the sails, dried and packed the spinnakers, and cleaned the boat bow to stern. I’ve never before gone through as many paper towels in my life! I had an incredible experience in the Vineyard Race…and who knew a team of eight juniors and two dads could beat Rambler? My friends raced so well, showing talent and skill on a long race. There were many times with only juniors on deck. The adults trusted us because the AYC Junior Big Boat Program, led by Peter Becker, taught us well. The dynamic of the team was perfect, and I could not ask to race with a better team. 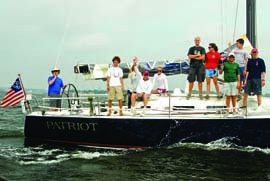 Like everyone on Patriot for the Vineyard Race I had a job, and that was helping on the foredeck. As soon as we started, we set our spinnaker for the long downwind. After about two hours, we decided to put up a staysail as well as the spinnaker. The new adjustment made us go ½ a knot slower, so we took it down. Later, after noticing that other boats in our division were passing us with staysails, we put it up again and went nearly a knot faster. That night we had lasagna for dinner and took turns steering, trimming spinnaker and grinding so that we could all eat. As soon as dinner was done, the watches started. There were three watches, and every three hours the kids that were sleeping moved onto the rail for standby. Those on standby took the wheel and spinnaker, and the three that had been sailing the boat went below to rest. On our way back to Stamford, we had to sail upwind through the Block Island Sound. The waves were huge, and every couple minutes one would break over the deck, preventing anyone on the rail from getting any sleep. As we were about to round Block Island, we had to make a jib change. We tacked from port to starboard and raised the new jib on the inside. Once it was up, we tacked back and dropped the old jib. Trying to pull down the old jib was hard work in the spray and constant rocking, but we eventually got it on the deck. Although it was hard work, the sail changes helped us maximize our speed throughout the race, and that was the difference between winning and losing. I sailed the Block Island Race on Lir, a Swan 45, earlier this year and had an idea of the racecourse and conditions for this one. I brought plenty of warm clothes because last time I froze! I was sailing with a lot of the same people and we thought we were well prepared for the race. Our first surprise was that all of the spinnakers were in the wrong bags! At the start, we put up the reacher instead of the runner! Fortunately, we had practiced sail changes so it was an easy outside set. We sailed the rhumbline course until we had to make the decision of going through the Gut or the Race. We all agreed to go through the Gut because more wind was predicted there…I think we all just secretly liked the name GUT. Carina and I had a friendly argument about what made the phosphorescence in the water. We argued until Haley put a stop to it and said it was algae. After many sail changes and job switches, Peter came up at about 0600 with hot chocolates, which we all gratefully drank. As soon as we finished the race and found out about the results, I had to laugh about beating my dad [AYC Fleet Measurer Mark Ploch], who was on Lir. The Vineyard Race was an experience that I hope will be the first of many. The start and first leg were characterized by constant actions and decisions, and was exciting in spite of the lighter conditions. Throughout the run we were pleasantly surprised with our position relative to the boats that started with us, and we developed a rivalry with the other J/122 Red Sky, since whether we were ahead or behind her (and by how much) was the most accurate gauge of how were doing. Most of the boats in our division were within sight until nightfall, so we were constantly motivated to make distance on the boats around us. After night fell, we separated from the fleet with Peter’s decision to exit the Sound through Plum Gut rather than the Race. We knew we were making a large gamble and it was difficult to hold the spinnaker while sailing through the Gut, but we were encouraged that our decision was correct when our SOG read over 12 knots – roughly three knots greater than our boatspeed. We caught some of the strongest current that flows through the Gut, and that in combination with stronger winds placed Patriot amongst boats that were all significantly faster. We worked hard to fly the spinnaker effectively on the final run, but our efforts paid off as we flew across the finish line. Our finish was one of the most spectacular moments of our race. We were enthralled by the results, although the experience of the first real distance race of my life far outweighs the value of our victory. Peter Becker, who was just as enthusiastic as we were, hopes to secure a boat for the 2014 Bermuda Race, and he’s made allusions to Transatlantic races. I hope this is only the beginning of a lifetime of larger, more adventurous races, but I’ll never forget my first Vineyard Race. 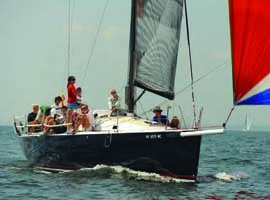 As mentioned on page 42, the Buzzards Society welcomes all sailors who have completed 10 or more Vineyard Races. The youngest sailor on Patriot, 12-year-old Madelyn Ploch, has a unique opportunity to become the youngest member of the flock. “If Madelyn does the Vineyard Race for the next nine years,” noted Peter Becker, “she will become a Buzzard before she ages out of the Corinthian class.” Go, Madelyn!